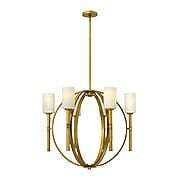 The Caspia 9-Arm Chandelier offers a fashion-forward take on classic Empire style lighting. 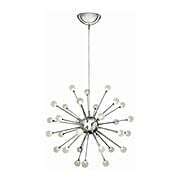 This traditional fixture is updated with a distressed silver-leaf finish and round crystal balls, graduated in size like a pearl necklace. Unlike reflective cut crystals, they capture and disperse light, creating a wonderful, watery effect. 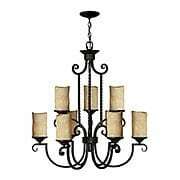 Chic and romantic, it is a lovely choice for your dining room, living room or foyer. 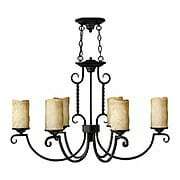 With its curled and twisted metal frame, realistic glass "candles", and distressed black finish, this rustic chandelier exudes Old World charm. Hanging in your bedroom or hall, it creates a warm and romantic atmosphere. How perfect for a Spanish colonial, Tudor, or other European style of home! Our Middlefield Collection defines the term "rustic modernism." Each bold and graphic piece is crafted from solid wood, which is bleached and distressed to resemble barn boards. 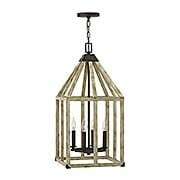 The straps, bars and candles are solid steel, faux-finished with an aged rust patina. Rugged, yet clean-lined, the look is perfect for cabins, Colonials or contemporary homes alike! 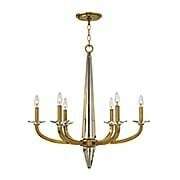 Our Rockford chandelier offers an informal take on traditional Federal style lighting. Replete with urns, beading and fluting, this classical design is dressed down with a rustic bronze finish and hand-blown seedy glass. Refined, yet rugged and sturdily crafted - it's the epitome of casual elegance! 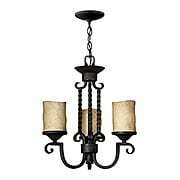 With its curled and twisted metal frame, realistic glass "candles", and distressed black finish, this rustic chandelier exudes Old World charm. Hanging above your dining table or staircase, it creates a warm and romantic atmosphere. How perfect for a Spanish colonial, Tudor, or other European style of home! Tradition with a twist! 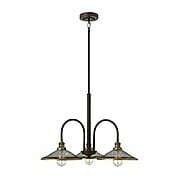 This Colonial-style Dakota 6-Light Chandelier gets a fresh update with industrial accents. Metal straps and buckles accentuate its traditional, seedy-glass hurricane shades and metal candles, while a rich bronze finish completes the look. What a handsome addition to period interiors. Tradition with a twist! 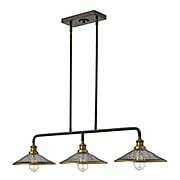 This Colonial-style Dakota 8-Light Chandelier gets a fresh update with industrial accents. Metal straps and buckles accentuate its traditional, seedy-glass hurricane shades and metal candles, while a rich bronze finish completes the look. What a handsome addition to period interiors. Tradition with a twist! 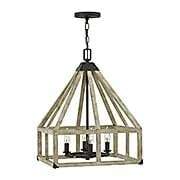 This Colonial-style Dakota 9-Light Chandelier gets a fresh update with industrial accents. Metal straps and buckles accentuate its traditional, seedy-glass hurricane shades and metal candles, while a rich bronze finish completes the look. What a handsome addition to period interiors. Our Emilie collection defines the term "rustic modernism." Each bold and graphic piece of this pendant is crafted from solid, white-washed wood to resemble barn boards. The connectors and candles are solid steel, finished with an aged rust patina. Rugged, yet clean-lined, the look is perfect for cabins, Colonials or contemporary homes alike! Impulse is a dynamic LED chandelier with a striking contemporary shape. Petite stems radiate from the spherical body while miniature acrylic ornaments of light glow at the tips. With your choice of three chic finishes, the effect is stunning. 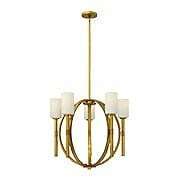 Inspired by early-American barn lighting, the Rigby chandelier is suited to a variety of interiors. This chic rendition features cast socket covers, mesh shades, and integrated two-tone finishes. What a fashionable addition to your dining room, living room, or bedroom. 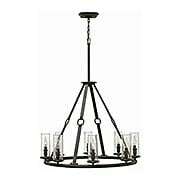 Inspired by early-American barn lighting, the Rigby chandelier is suited to a variety of interiors. 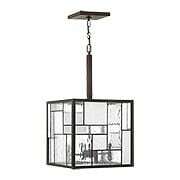 This chic rendition features cast socket covers, mesh shades, and integrated two-tone finishes. What a fashionable addition to your dining room or over your kitchen island. 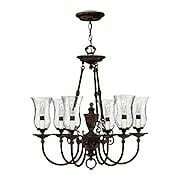 The Ascher chandelier is a Colonial-style stunner. 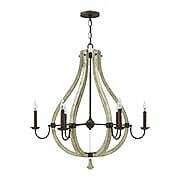 Featuring a faceted, solid-crystal column, streamlined arms, and crystal bobeches, this dazzling chandelier is suited for your entry, living room, or bedroom. A luxe caramel finish is the perfect complement to this sleek, transitional design. 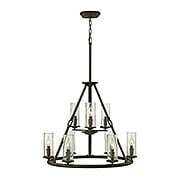 With its captivating mix of rustic and refined, the Bastille 6-Light Chandelier displays European sophistication. Encircled by a bronze metal ring, the distressed wood column is dressed in an aged chestnut finish with copper highlights. This old-world style beauty is a charming addition to any traditional setting. 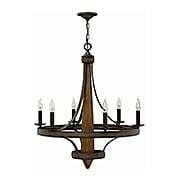 With its captivating mix of rustic and refined, the Bastille 8-Light Chandelier displays European sophistication. Encircled by a bronze metal ring, the distressed wood column is dressed in an aged chestnut finish with copper highlights. This old-world style beauty is a charming addition to any traditional setting. Lighting as a work of art! 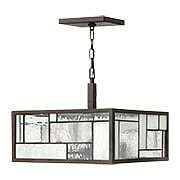 This striking chandelier recalls that abstract paintings of Dutch artist Piet Mondrian (ca. 1930s). The bold Modernist design features a bronze grid inset with alternating panels of clear, seedy and opal glass. A perfect choice for modern homes of any era. Gleaming and futuristic, the Midtown series recalls French Moderniste lighting of the 1930s. Blending satiny brushed nickel and faceted tubular glass, the five light chandelier is a stunning choice for Deco to contemporary interiors. Tailored silk shades and a worn bronze finish give the Plymouth fixtures a clubby, old-world feel. 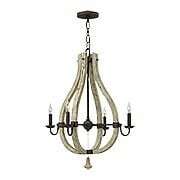 Gracious and well-mannered, this large chandelier is a tasteful choice for your dining room or entry. 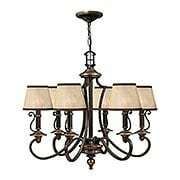 With its curled and twisted metal frame, realistic glass "candles", and distressed black finish, this rustic chandelier exudes Old World charm. Hanging above your table or staircase, it creates a warm and romantic atmosphere. How perfect for a Spanish colonial, Tudor, or other European style of home! 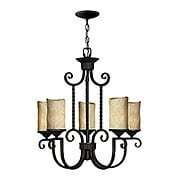 With its curled and twisted metal frame, realistic glass "candles", and distressed black finish, this rustic chandelier exudes Old World charm. 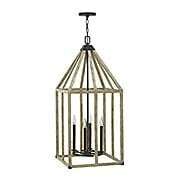 Hanging over your dining table or kitchen island, it creates a warm and romantic atmosphere. How perfect for a Spanish colonial, Tudor, or other European style of home! 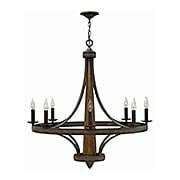 With its curled and twisted metal frame, realistic glass "candles", and distressed black finish, this rustic chandelier exudes Old World charm. Hanging in dining room or foyer, it creates a warm and romantic atmosphere. How perfect for a Spanish colonial, Tudor, or other European style of home! 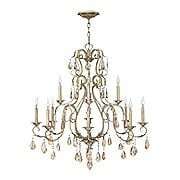 Authentic silver leaf, applied over gold and highly distressed, gives this elegant chandelier a softly shimmering quality. The delicate wrought iron frame is draped with pearlescent amber crystals, which create a subtle sparkling effect. 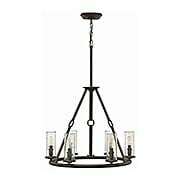 With 5 lights and a 24" diameter, it's a lovely and feminine accent for your dining room, living room or foyer. 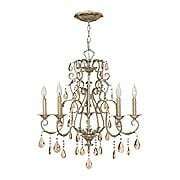 Authentic silver leaf, applied over gold and highly distressed, gives this elegant chandelier a softly shimmering quality. The delicate wrought iron frame is draped with pearlescent amber crystals, which create a subtle sparkling effect. 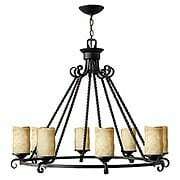 With 12 lights on two tiers, it's a lovely and feminine accent for your dining room, living room or foyer. Gleaming and futuristic, the Midtown series recalls French Moderniste lighting of the 1930s. Blending satiny brushed nickel and faceted tubular glass, the nine light chandelier is a stunning choice for Deco to contemporary interiors. 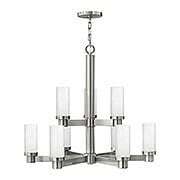 Despite its modern flair, the Margeaux 5-Arm Chandelier with Etched Opal-Glass Shades is grounded in ancient themes. The arms are stylized versions of a burning torch, the openwork body derived from an armillary, or celestial globe. The result is familiar, yet forward looking, suiting settings from the antique to the futuristic. For a softer look go with mellow vintage brass, or for high impact, choose bright polished nickel! 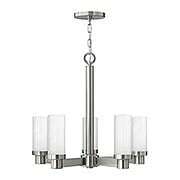 Despite its modern flair, the Margeaux 6-Arm Chandelier with Etched Opal-Glass Shades is grounded in ancient themes. The arms are stylized versions of a burning torch, the openwork body derived from an armillary, or celestial globe. The result is familiar, yet forward looking, suiting settings from the antique to the futuristic. For a softer look go with mellow vintage brass, or for high impact, choose bright polished nickel!